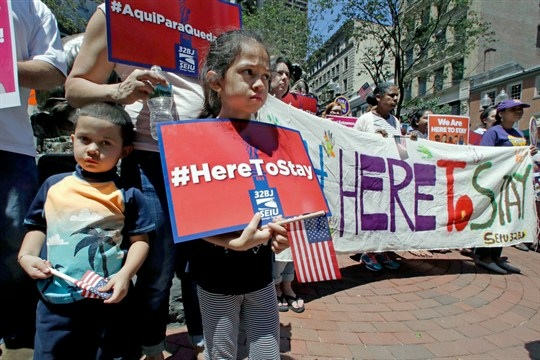 Nicole Castillo, 7, of East Boston, holds a sign while standing with her brother Diego, 4, and mother Elsa, who is originally from El Salvador, during a “Here to Stay” rally, Boston, July 6, 2017 (AP photo by Charles Krupa). On Oct. 12, U.S. Attorney General Jeff Sessions claimed that America’s asylum process was “subject to rampant abuse and fraud,” that migrants were taking advantage of the system and that “genuinely meritorious” asylum claims were down. He offered no evidence for these sweeping statements beyond the fact that asylum petitions had increased in recent years and his claim that “many”—he didn’t say how many—asylum-seekers who pass “credible fear” interviews, the initial screening process for those seeking asylum at the U.S. border, then “simply disappear and never show up at their immigration hearings” once they are in the country. Sessions’ comments reflected attempts by the Trump administration to link the asylum process with hard-line immigration reform, both of which have serious consequences for Central Americans.